After a gap of 14 years, the CM of Delh finally inaugurated the Signature Bridge. Announced in 2004, the bridge will be reduce travel time between North and North-East Delhi, while sharing the traffic burden of Wazirabad Bridge. 1. 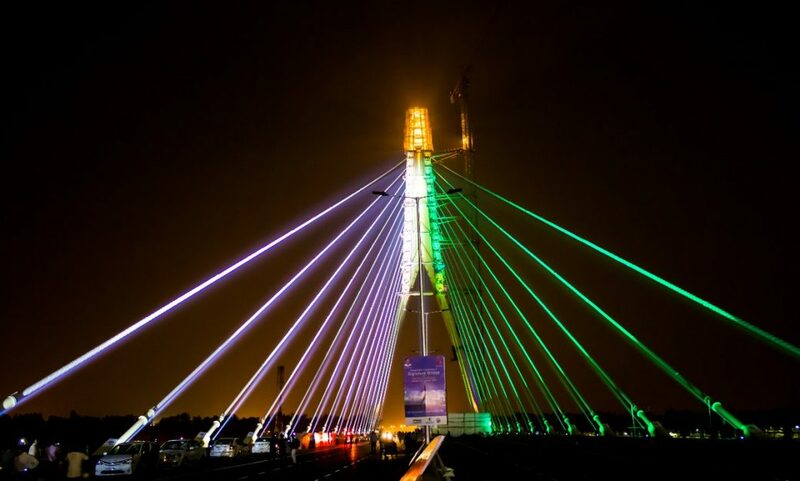 The bridge is being projected as India’s first asymmetrical cable-stayed bridge. In fact, it’ll also come along with the gesture ‘namaste’. 2. The graphics projected on the bridge will symbolise a modern and progressive India. The bridge has a 154-metre-high glass viewing box, which is double the height of Qutb Minar. Besides, the bridge will also have multiple selfie spots. 3. With a 250 mm thick steel plate fabrication, the bridge is one of the most contemporary landmarks in Delhi. 4. The Signature Bridge is an 8 lane carriageway connecting Outer Ring Road and Wazirabad Road. Thereby, reducing the travel time to Ghaziabad by 30 minutes. 5. Furthermore, it boasts of 127 strands of back-stay cables, spherical bearings of 17,300 tonne vertical capacity. In fact, it also has a pendulum bearing to resist uplift of 6,300 tonnes, and transportation and handling of 460 tonne of pylon base segment.